Bee pollen,good pollen, and the best pollen. taking pollen on a daily basis is an excellent way to balance and supplement your diet. Pollen is the most natural way to take care of your health. 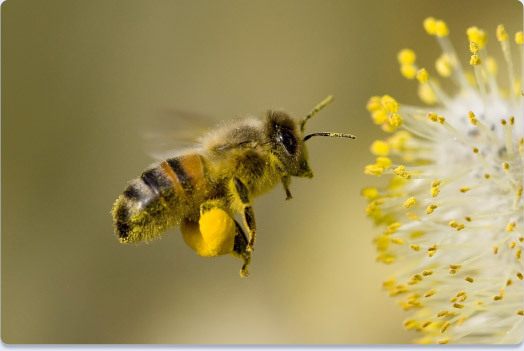 Pollen collected by bees is the most complete food you can find from plant origin. 20% of its components are proteins with almost all essential amino acids. It also contains a high and varied array of vitamins, minerals and carbohydrates. Because of the high concentration and nutritive elements, it is an ideal complement to our daily diet in a most natural way. 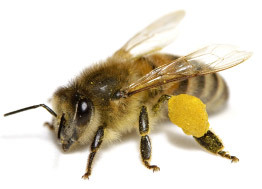 It is the main source of protein, vitamins and minerals from bees. To transport it from the flower and store it in the hive, they add nectar. This process enriches the pollen and makes it much easier to digest. Rhinitis and asthma can appear as allergies if pollen is inhaled, but not with ingestion, so eating bee pollen not only is good for you, but often acts as a kind of vaccine against these conditions improving the situation. In the event that one suffers from rhinitis or asthma, one should take precaution and begin by taking very small amounts of bee pollen and increase the dose progressively over the course of a few weeks to the normal daily dose. Our bee pollen is natural and 100% national, direct from the last harvest. Collected and packed in the finest conditions in order to maintain its properties. Our bee pollen is mainly Rockrose pollen, but bees also collect pollen in other wild plants, away from contaminated areas. 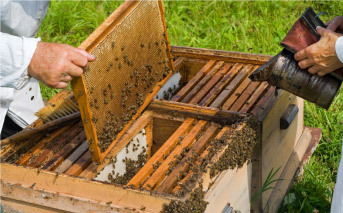 Beekeepers collect it daily to maintain its freshness and properties intact. These are qualities we protect until Mielars bee pollen comes to you. 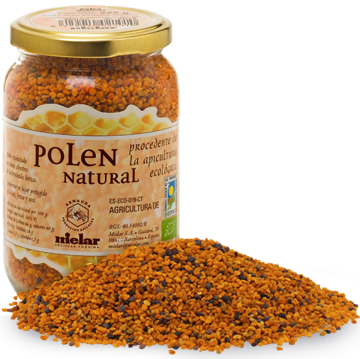 Mielar's bee pollen: natural bee pollen, always from the last harvest and in the best conditions. With a spoonful of bee pollen a day one will notice a difference in ones mood and energy. Ones performance and endurance will be improved Its wealth of nutrients, along with a well-balanced diet and exercise, is the most natural way to prevent diseases. The number one natural food supplement. Suitable for all ages. • In addition to vegetarian and macrobiotic diets. • To support growth and development of children. • During pregnancy and lactation. • For those who are weak and recovering from illness, overworked or under a lot of stress. • For people with anxiety, nervousness and irritability. • For those who are dieting or on a low cholesterol diet. • For regular bowel movements. • To combat sexual apathy. • In cases of vitamin deficiencies. 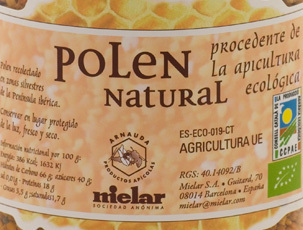 With the official certification Mielar guarantees that our bee pollen is 100% natural. From the flower to your hands you can be sure that the bee pollen has not suffered any contamination by pesticides or chemical fertilizers, and the bees that have collected it, have been treated with natural authorized products. Sugars: mainly fructose and glucose, and to a lesser extent sucrose, trehalose, maltose, isomaltose, erlosa, etc. Fatty acids: palmitic acid, linoleic acid, linolenic acid, oleic acid, caprylic acid, lauric acid, myristic acid, stearic acid, capric acid, arachidonic acid, etc. Amino acids: aspartic acid, glutamic acid, tryptophan, leucine, lysine, isoleucine, valine, proline, phenylalanine, arginine, serine, glycine, tyrosine, methionine, hydroxyproline, cystine. Minerals: Selenium, iron, calcium, silicon, zinc, potassium, sodium, copper, magnesium, manganese, phosphorus, etc. Vitamins: Beta Carotene, B1, B2, B6, C, D and E.
Others: Enzymes such as diastase, amylase, phosphatase and invertase. Pigments. Flavonoids, which give it its antioxidant capacity and phytosterols, which help control cholesterol levels.